Rapidly develop hardware and software based on a GPS receiver module or GNSS receiver module with the Master Development System. It comes with a fully assembled development board for benchmarking and prototyping. The development board has an OLED display for viewing the satellite data, which allows the development board to operate as a stand-alone device. A large prototyping area and module interface header makes adding custom circuitry easy. This allows the development board to act as a prototype. One GPS receiver or GNSS receiver is on an evaluation board that plugs into a socket on the development board. This makes it easy to swap the module between the development board and your prototype board for testing and debugging. A spare module is also included for use on your prototype boards once testing is complete. 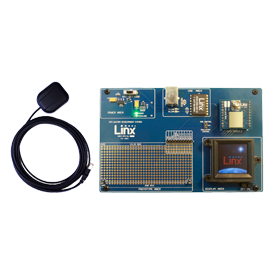 Linx offers several GPS receivers and GNSS receivers, but each has their own evaluation module that fits into the common socket on the development board. The Development System also includes demonstration software that interfaces with the development board through a USB interface. This software shows the satellite data and provides mapping functionality. This aids in evaluation of the module and test and debugging once a design is begun. The system includes batteries, antenna, documentation and free technical support; everything that is required to test and implement Linx GPS receivers and GNSS receivers. Integrate with ease: EVM allows simple connectivity for custom prototyping and designs. Mobile Evaluation: on-board color display offers evaluation without requiring a connection to a PC. The latest software included in the GPS Series master development system. Demonstrates the functionality of Linx GPS receiver modules and GNSS receiver modules.